Southeast University is recognized by WHO and the graduates of MBBS program are eligible to take the Medical Licensing Examinations held by the medical councils in different countries such as MCI, PMDC, USMLE, HPCSA, SCHS etc. Students can choose to do the internship/training in China, their home country or any other country. The institutions shall meticulously organize the reasonable arrangement of the internship. The duration of the internship is one year (at least 48 weeks). If students want to do the internship in China, SEU would help student to choose a hospital from 20 hospitals in Nanjing. Before internship, students need to pass the HSK Level 5; otherwise the university will arrange a Chinese student as translator to assist during the internship. The accommodation will be settled by the relative hospitals. SEU host 10 affiliated hospitals of different categories and over 40 teaching hospitals around China. If students want to do the internship in other country, SEU needs to do a qualification evaluation on the hospital which student chooses. And when the internship is over; they should finish the relative internship reports and bring back the internship certifications. As long as the students finish all the courses and credits in the 6 years, when the internship is ended, they can post their necessary graduation documents such as internship report to the university. After validation, the university will mail the graduation certificates and diplomas to the students if they meet the graduation requirements. And, students have to take the final examination on Theory Test and Clinical Evaluation in SEU. 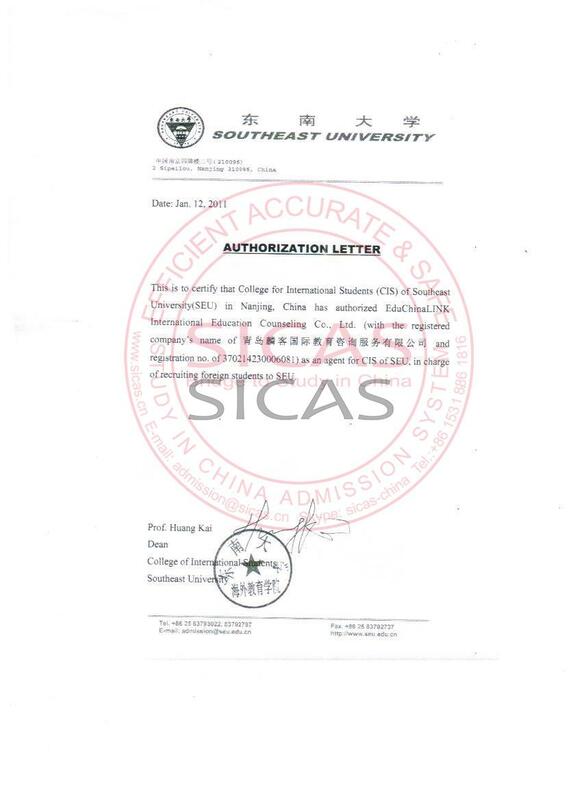 Southeast University Excellence Scholarship (Provided by SEU according to students鈥?performance). 1.Over 16 years old, healthy. 2.High school graduate or above, or have passed Grade Twelve (10+2)/FSc./A Level/WAEC or equivalent. 3.At least 60% score in science subjects: Mathematics, English, Biology, Physics and Chemistry.